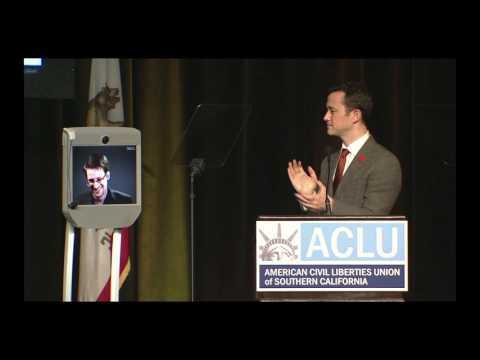 Government whistleblower and civil liberties hero Edward Snowden surprised actor Joseph Gordon-Levitt, when he presented Gordon-Levitt with a Bill of Rights Award via the "Snowbot," a live telepresence robot, at the 2016 ACLU of Southern California Bill of Rights Dinner on November 13. Khizr and Ghazala Khan, civil liberties advocates, Gold Star parents of U.S. Army Capt. Humayun Khan, who was killed in Iraq in 2004. Norman Lear received the Ramona Ripston Liberty, Justice & Equality Award for his lifetime commitment to civil liberties and the work of the ACLU. Frank Cooper III, Joseph Gordon-Levitt and Catherine Hardwicke received the annual Bill of Rights Award for furthering diversity efforts, promoting free speech, empowering women and otherwise supporting civil rights and liberties for all Americans. Past honorees have included Barbara Streisand, Dustin Hoffman, Martin Scorsese and Kerry Washington. Khizr and Ghazala Khan, who drew worldwide attention at this year’s Democratic National Convention for their statements in support of Constitutional guarantees, were the recipients of this year’s Eason Monroe Courageous Advocate Award. Special guests at this year’s dinner included two-time Academy Award-winner and activist Jane Fonda; actress, writer, producer and activist Nikki Reed; and Russell Simmons, the entrepreneur, producer, author and chairman and CEO of Rush Communications. The dinner also featured special performances by Danielle Truitt and Aloe Blacc.